Click on any guitar to learn more about its project in my shop! The goal of this project was to restore this guitar to as close to original as possible and add a jazz-style pickup. This 60's - vintage archtop Kay guitar had been modified to allow for 8 strings - including two raised drone strings. The headstock had been fitted with two extra machines and the nut and bridge both had raised portions. The neck had become unplayable over time as well. other mechanical parts, carve a vintage bone nut, order and install a new, adjustable bridge, clean, oil, and polish the guitar and test it with new strings. - The neck P90 pickup sounded muddy, so it was replaced with a ' gold' Lace Sensor cleverly attached to the underside of the P90 cover, to maintain the aesthetics. neck position. Single coil use sounds Strat-like. Gold strap locks were added, plus shielding of the control cavity to help overcome any hum from the single-coil mode. Not shown was the subsequent addition of a gold Bigsby tremolo. recording engineer at a studio that sometimes gives me their guitars to work on. The owner hadn't had time to finish the project. See below for the work that went into making this a very cool doubleneck guitar! the new body. The Bigsby tremolo from the reissue was kept. The original baby blue body was replaced with this gorgeous Warmouth body with a "Mary Kay" finish - semi transparent white with pinkish overtones. A new Warmouth tortoise shell pickguard and rear spring cover were used. To get an "acoustic" sound, A Fishman PowerBridge was installed along with their PowerChip preamplifier. It puts out either a stereo signal that can route the piezo "acoustic" sound to a PA, and the normal pickups to the amp, or a mono signal which mixes both signals together for some unique tones. The small chrome switch by the middle knob switches from piezo, to both, to magnetic pickups. The middle tone control was changed to a "VOLUME" knob and controls the "acoustic" output. The remaining tone control was rewired to work on all magnetic pickups. The interior was shielded and star-grounded to reduce hum from the Lace Sensors. The guitar came with Strap locks, so all that was left to do was setup and polishing. Despite the excellent care taken of this gorgeous semihollowbody Ibanez, it had sustained a deep fingernail sized gouge deep into the wood of the neck, a half inch finish dent in the front, and numerous small dings on the headstock. The owner wanted to make the damage disappear as much as possible. He also wanted to add circuitry to maintain treble while turning down the volume, and also allow one pickup to still stay active when the other's volume was all the way off and the pickup selector switch was in the middle position. Gold straploks were also requested. First the strings were removed, and corrosion was cleaned off the gold hardware. One hopeless screw was replaced. Straploks were installed. Custom bypass and shock-resistant capacitors were added and volume wiring changed for single-pickup use when switched for both. Then the damaged areas of the front and neck were cleaned and filled. The neck filler was stained, then both areas were laquered multiple times, sanded flush and polished. The headstock dings were filled. Strings were installed, the guitar was set up and tested. All pictures taken after the work was finished. This is my personal "dream guitar." It started as a sanded-down Epiphone "Kat" body and neck - no hardware or finish. Smaller than a 335, bigger than a Les Paul body. I filled in wood defects and changed the shape of some holes, slimmed the neck, and had it painted white to start my all gold-and-white color scheme. My logo was inlaid in abalone in the headstock. My plastics supplier custom-made white perloid switch covers and the truss rod cover. Step one was to disassemble, unwire, and clean the guitar inside and out. The pickguard was unshielded (invites hum), so best-quality copper shielding was applied. The pickup supplied for the middle position was a double-coil blade pickup designed to fit in All three pickups were capable of coil-tapping, so the old controls were replaced with new push-pull types for coil tapping the neck and bridge pickups. The customer wanted a mini-switch installed between them to allow the new middle pickup to be coil-tapped as well. The 3-position switch was replaced with a new 5-position switch which performed the same as a Strat. Finally, an anti-grounding-shock capacitor was placed between the ground and the bridge/strings. Wires were bundled, the guitar set up and tested before a final buffing. This guitar is an example of some pretty fine cleanup and electronics work. 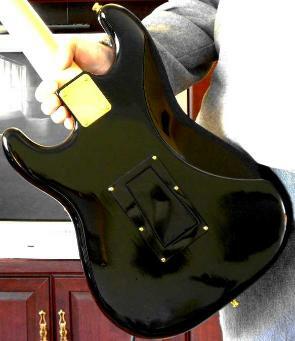 The guitar came with two humbuckers and an empty middle slot in the pickguard. It had a 3-position pickup switch. It was very dirty inside and out and had shoddy wiring (the tone control wasn't even connected) and incomplete shielding. This very nice Telecaster was enhanced by the addition of a Fernandes Sustainer and Bigsby B5 tremolo. The original pickguard and bridge plate are the starting point for new ones. In the first picture, paper templates for positioning and for sending to the pickguard manufacturer are made. In order to cover original routing and various holes, a large pickup ring was made out of the original bridge plate, and a small plastic piece was fabricated from pickguard material to cover holes between the Bigsby B5 and the new pickup ring. In the 3rd picture, all the parts have arrived and two custom routing templates have been made. On the right, ciruit card, installed in custom pickguard, next to its cavity after copper and carbon shielding is applied. 5th picture: positioning of the Bigsby and the bridge must be precise. 8th picture: battery box covers the worst parts. last picture: original back with damage to be covered.